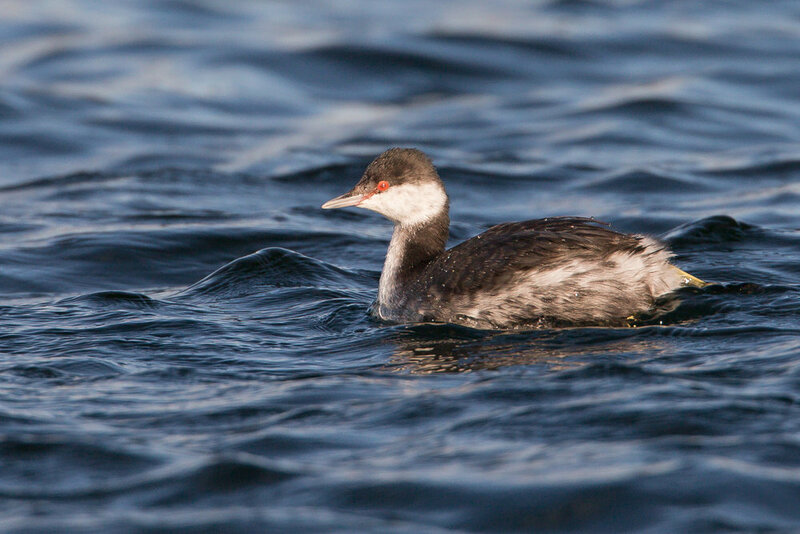 THE SLAVONIAN GREBE CONTINUES AT ALSTON RESERVOIRS. Still on the 'more accessible' no. 1 reservoir, I managed to catch up with it again today, this time in bright sunshine. The sunshine deepens the blue colour of the water and for the same reason that early morning shadows are blue, the shorter wavelength blue part of the spectrum is not absorbed by the water and is reflected. 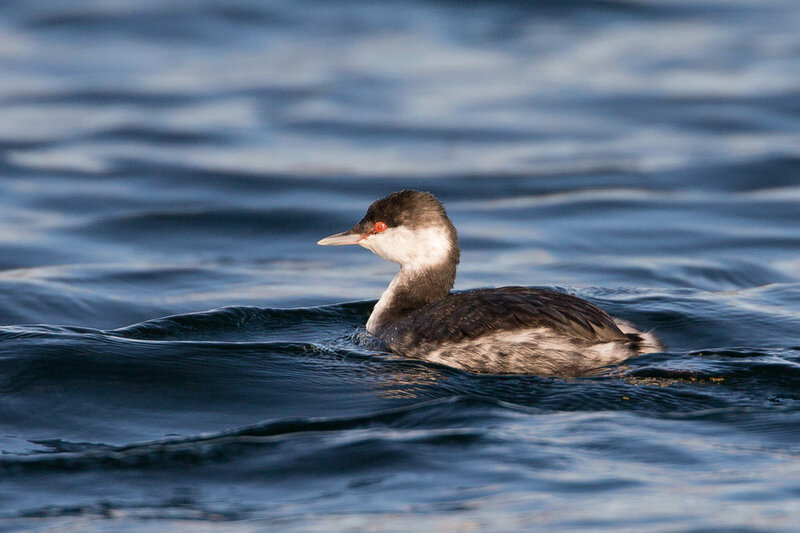 There are a couple of things to remember when photographing birds on water. First of all shooting in RAW allows you to change the white balance and these images were processed at 7500K (i.e. warmer than the 'cloudy' setting). This reduces the intensity of the blue light reflected by the surface of the water. Believe it or not the water was actually much bluer than this at a daylight (i.e. sunshine) white balance setting. I often think that deep blue backgrounds distract from bird subjects. The second thing is that waves create constantly changing patterns so high burst mode is worthwhile to catch either a nice distribution of wave shadows in the background as well as any (desirable?) splashes of water. The three shots below are consecutive frames at 14fps showing how much can happen in such a fraction of a second! As usual it's all a question of personal taste, there is not right and wrong, this is just my preference. Back to the grebe itself, you can see that it has now moulted its cheek feathers and looks much smarter! 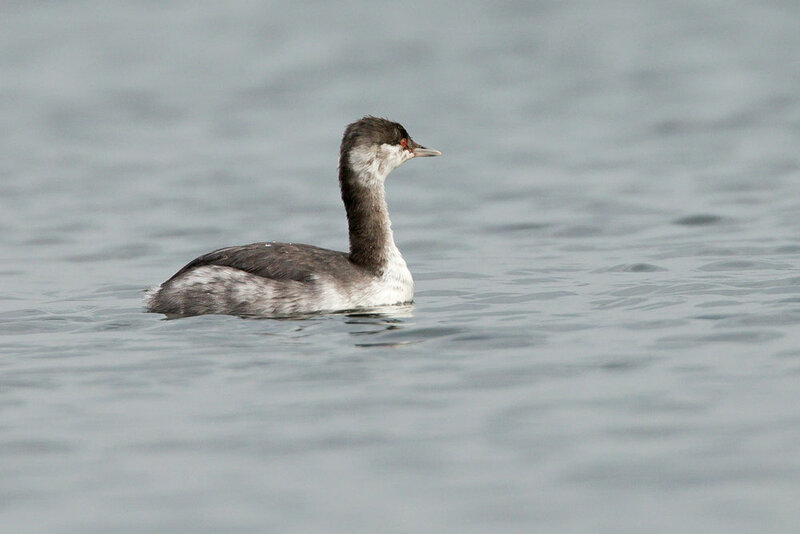 The long-staying Alston Slavonian Grebe has spent all of its time so far on no.2, quite distant and uninspiring but I was happy to see that it had moved to the 'accessible' no. 1 reservoir today, where was feeding close to the shore by the pumping tower. This is only the second Slavonian Grebe in East Lancs since I moved here 12 years ago, the previous one was even more approachable at Barrow Lower Lodge in 2008. Other birds at Alston today included a brief Peregrine that perched on the pylon behind the wetland, kicking a raven off it in the process, a Green Sandpiper was also on no. 1 and a late curlew was flying around calling. There were also more passerines on the move today including meadow pipits, pied wagtails and skylarks. An enjoyable morning.